and Great Newspaper Clippings from 1965! A group of people who were involved with the previous reunions have recently begun discussing a more casual reunion in 2020. Our ideas are based around keeping it a little simpler than the reunions held in 2011, 2014, and 2017. We’ve been thinking of focusing on two nights – a casual Friday get-together at the old Civic Center on the beach and on Saturday a slightly more organized dinner at the Abacoa Country Club. We’ve even tentatively set aside October 16th and 17th for this two day event. We envision inviting everyone associated with this website. In other words, that would be the classes of 1956 through 1967. Even though these dates are pretty far away, we thought it would be wise to give everyone ample time to mark their calendars. We would also love to get more people involved. That way no one would have to work too hard. After all, we’re not getting any younger. We’d love to hear from you about these ideas and whether you would like to attend. Feel free to leave a comment in the Message Forum section or contact any of us directly. 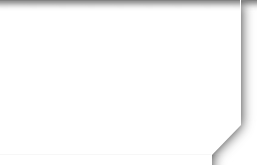 When you’re logged into the website, you can find anyone’s profile and send them a “private message” or post a comment on their “Profile” which others can see. 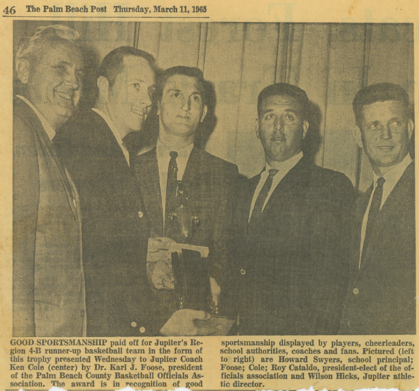 Mike and Judy Barnes were kind enough to scan some clippings from their archives relating to the 1964-1965 JHS Basketball Team. These clippings really convey those times. 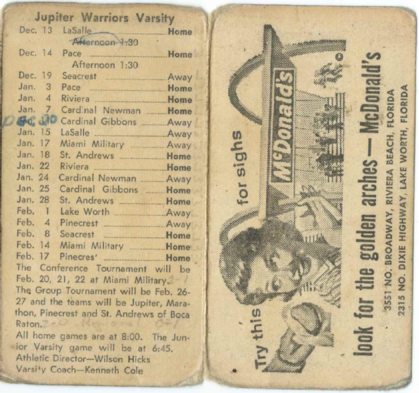 Let's start with the schedule, kindly brought to you by McDonalds. Jupiter is the only high school in Palm Beach County without a basketball gym, but this has been a blessing in disguise in the opinion of Coach Ken Cole. A Class B school, Jupiter currently sports a record of 12 victories and two defeats against mainly Class AA-A opposition. Its two defeats came in the Vero Beach Holiday Tournament - to Class AA McCarty by a point and to Class A Bartow by six points. Its Class AA victims include Delray Beach Seacrest and Lake Worth of the Suncoast Conference. Cole, in his second season as head coach of the Warriors, says, “hard work and emphasis of fundamentals” are the main reasons behind the 12-2 record and doubts that fundamentals would have been stressed so much if Jupiter had its own gym. 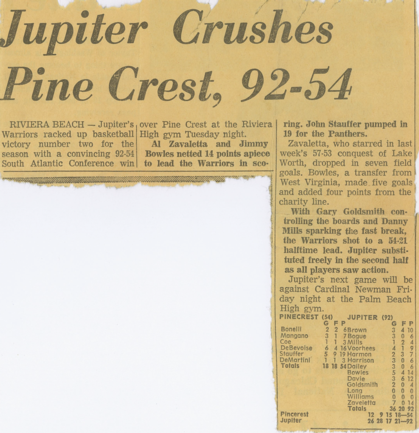 Jupiter uses Riviera Beach for most of its home games. The Warriors tallest regulars are Dan Dailey and Don Davie, both of whom stand 6-1. Dailey and Davie have been the “big” players off the board for the Warriors, averaging from 12 to 13 rebounds a game. 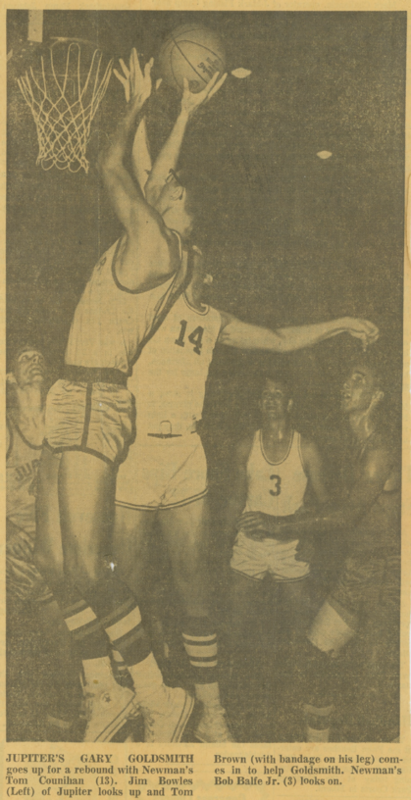 Tom Brown (6-0) is leading the team in scoring with a 19.6 average on 275 points in 14 games. Next is 5-11 Al Zavaletta, who carries a 14.5 average. Other starters are 6-1 Dailey with a 13.1 mark, 6-1 Davie with 9.2 and 5-9 Danny Mills with 6.0. Cole says Brown is averaging close to 50 per cent of his field goal shots. The Warriors make the most of their free-throw attempts. “Brown is 76 per cent from the foul line, Dailey is 80, Davie 71 and Zavaletta 70. Dailey went 10-for-10 the other night,” the coach said. Cole was junior varsity coach under Floyd Wilkes when the Warriors played in the Class B state tournament two years ago at Gainesville. 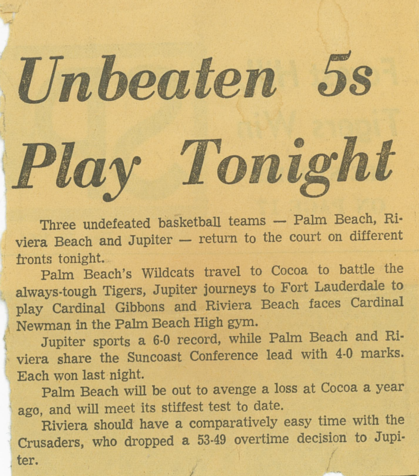 He would not compare his team or the 1962-1963 team that lost to Florida High of Tallahassee in the tourney opener, but believes the current team has a good chance to return to the tourney. He listed Frostproof as the toughest hurdle in the Warriors’ bid for state recognition. Cole refuses to take full credit for the team’s success. But the Jupiter skipper has to keep up with those fundamentals because he hasn’t a gym big enough to do otherwise. 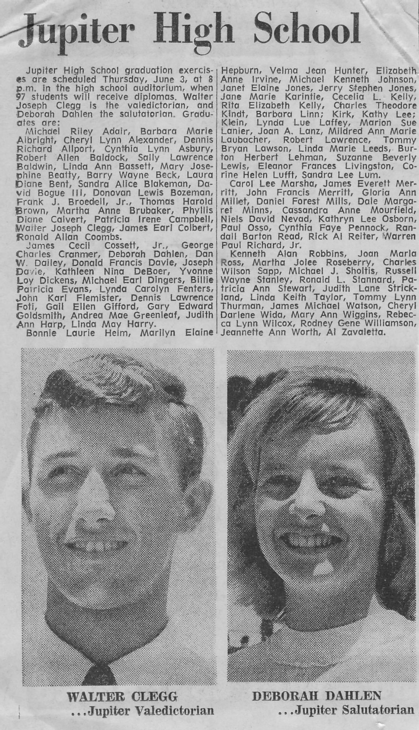 While going through some family memorabilia, Debbie Dahlen McKinney recently came across a newspaper clipping announcing the 1965 JHS Graduation. She was kind enough to scan it and let us display it here. We thought it was a fascinating insight into how the graduation ceremony was a community event of interest to the whole town. Grace Sardinha Grenfell was nice enough to share a letter she received announcing an organizational meeting of a steering committee for the completion of our High School Auditorium remodel. They also have set up a fund raising site for this project. We thought it appropriate to modify the link on the left that had Dan Gladwin's report on the remodel of the rest of the school from 2009 and call the new link, JHS Remodel Project. Dan's report is still there and as we learn of progress on this project, we will add the news under the new link. We are pleased to post a video of the recent parade honoring the five Jupiter High School State Championship Teams from the 2017-2018 school year. We hope you enjoy it! Just a note some of you may be missing emails, emails have been bouncing back please set your current email to accept mail from noreply@classcreator.net. One other thing to check is your profile and see what email address you are using or if you have changed it but not here at this site, please update, thanks!! Setting up password protection was for your protection in this crazy world of social networking.